Over the last few years, severe weather events have become more common and damaging than ever, costing the nation millions of dollars in damages. As weather threats increase, protecting your possessions should be a priority; this includes your vehicle(s). Since vehicles are typically parked out in the elements, they are directly exposed to any type of weather that strikes them. 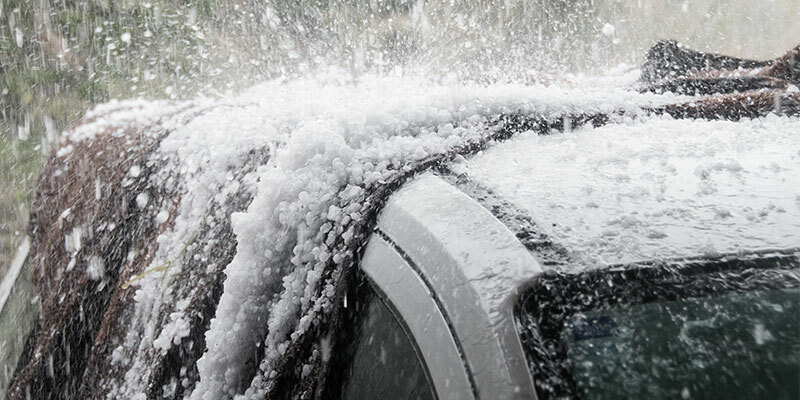 Though vehicles are durable, they cannot withstand severe weather as much as your home—making them vulnerable to damage. In 2017, hundreds of thousands of vehicles were damaged and written off as total losses from hurricanes alone. Depending on which part of the country you live in, your vehicle may be more susceptible to certain weather occurrences than others. Being proactive and ensuring that your vehicle is protected against severe weather will ease the burden from out-of-pocket expenses or a total loss on your vehicle(s). It's a common misconception that homeowners insurance will cover a car parked in a garage or driveway. To be clear, In the event of a garage flooding or a home collapsing due to severe weather, a vehicle is not protected under your homeowners insurance policy. The smartest way to protect your vehicle is through comprehensive coverage. Comprehensive auto insurance will help to replace or repair your vehicle in the event that it's damaged by something other than a vehicular accident. There is a wide range of items covered, but when it comes to weather-related damage, coverage will typically include windshield replacement, hail damage, fire damage, flooding, and even damage from fallen trees. If you're financing or leasing your car, it's likely your lender requires comprehensive coverage. However, if you fully own your vehicle, comprehensive coverage is optional. No matter the stage of ownership you're in with your vehicle, comprehensive coverage is vital to ensuring your expenses and vehicle's value are protected from extreme weather. If you find yourself in a position without comprehensive coverage and a weather threat, such as a hurricane has been forecast, it's likely too late for you to opt-in for coverage. Insurance companies restrict the purchase of comprehensive once a weather threat is predicted. This restriction is to prevent fraudulent claims by people who want to pay for the coverage for just a few days in the event of emergency versus always carrying it just in case. This type of last-minute planning could leave you paying for expensive damages or losing all value on your vehicle. Move your vehicle into your garage or under a carport if you have one. Avoid parking under trees or near bushes. Should limbs fall during storms, they might fall on and damage the car. Consider investing in a weather-resistant vehicle cover. This device might help protect the vehicle from falling objects or hail damage. Ensure you roll up your vehicle's windows and close sunroofs. You don't want rain or other debris damaging the interior. Many people forget to check their windows, and the damage might prove costly. If flooding is a risk, consider moving your vehicle to higher ground, if it's a viable option. Regardless of what you do, remember that your own life is a lot more important than your car's—and you shouldn't do anything to protect your car or your other property that puts your life in danger. Give yourself peace of mind, and prepare with the right coverage ahead of time.